T Minus 24 Hours until the start of my “Do It Yourself” Book Tour. First stop? Washington D.C. Then Florida, Texas, Toronto, New York, Pittsburgh, Chicago… and then the western half of the country. Here’s the first half of my book tour. Live in one of these places or know somebody who does? Please help me get the word out! 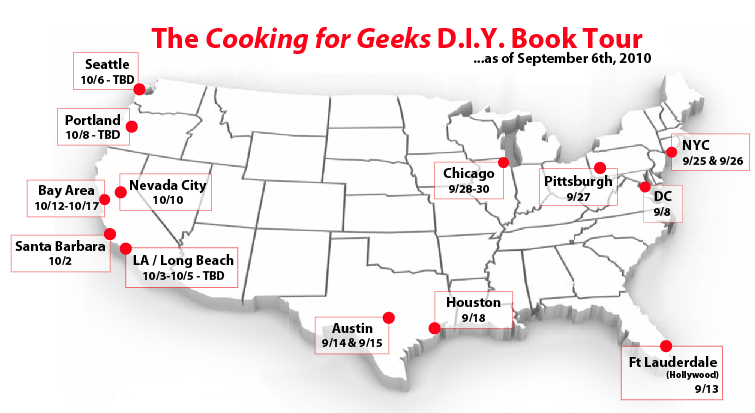 I’ll be doing book talks, demos, Q&As, and exploring the local food scenes in each of these places. Snag a book—preferably one from me, but happy to sign any copy, of course!—and come meet me. My october schedule will be out in a few weeks. Live in the LA Area, Seattle, Portland, or the Bay Area? Want to help out? Help me organize a talk. Sept 13th, 7:00 pm: VINO, 1910 Harrison St in Hollywood, FL. No tickets required; please bring $35 in cash to purchase a signed copy of the book. Sept 18th, 11:15 am: Houston Area Apple Users Group.